OCZ Technology has unveiled the successor to their popular Vertex 3 solid state drive at CeBIT in Hanover, Germany. Officially known as the Vertex 4, the fourth generation SSD utilizes an Everest 2 controller and synchronous MLC flash memory that’s reportedly good for speeds up to 550MB/s read and 500MB/s write and up to 90,000 IOPS (4K Random Write). We first saw this Everest 2-based solid state drive at CES 2012 although it wasn’t called the Vertex 4 at that time. OCZ demoed the SATA 6GB/s drive for us in January using IOmeter, CrystalDiskMark and AS SSD and it performed as advertised, consistently outperforming current-generation drives like the Patriot Pyro and Corsair Force 3. OCZ announced that they were exiting the memory game in early 2011 citing a weakness in the global DRAM industry and rapid growth in the solid state drive market. The company then acquired South Korea-based Indilinx who they previously collaborated with on the original Vertex SSD. The Vertex 4 is the second drive to utilize technology from the acquisition and the first to use the Everest 2 platform. OCZ launched the Octane SSD in October 2011 featuring the original Everest controller and was notably the first SSD to achieve up to 1TB capacity in a 2.5-inch form factor. 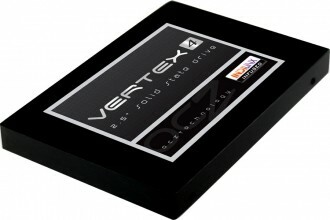 OCZ hasn’t published an official release date for the Vertex 4 but we expect to see units making their way to retailers within the next few months. The drive will be available in capacities up to 2TB.